The Australian gambling landscape is rapidly evolving and there are constantly new betting sites joining the fray. This page will teach you about the best new online bookmakers servicing Australia. 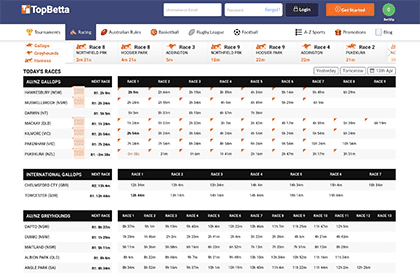 Since Sportsbet became one of the first online corporate betting sites to contend with the Australian regulated bookmaker Tabcorp in 2002, there has been a rush of companies looking to get involved. Over the last six years Australian punters have seen international giants like Paddy Power make enormous investments and buy-outs of well-known brands, but over the last 24 months Australian-owned and managed bookmakers are making a comeback. As each online bookmaker bursts onto the scene, punters have an opportunity to cash in on whatever they use to hook new customers. BettingSite.com.au cannot express the importance of having multiple betting accounts to our readers enough. Make sure that when a new online bookmaker is making a play for your business, you use their offers to maximise every cent you gamble. There is no law against betting on multiple accounts – so you can use different bookmakers to get the best sign-up offers, the best racing or sport specials and to make sure that you always get the best odds. After several years in the wilderness, the BetEasy brand is back and bigger than ever. The brainchild of former Sportsbet CEO Matt Tripp, the bookie rose to prominence under the CrownBet banner with the backing of James Packer’s Crown Resorts. That partnership dissolved with the sale of Packer’s shares to the Stars Group in 2018, the same year the company bought out William Hill Australia. BetEasy is now one of Australia’s biggest online betting firms. It is the official wagering of the AFL and has a well-earned reputation for delivering some of the best bookie promotions, specials and rewards in the business. Neds is the newest bookmaker to hit the Australian market. The brainchild of former Bookmaker.com.au owner and Ladbrokes CEO Dean Shannnon, Neds went online in October, 2017 and immediately impressed with a well-designed website and great iOS and Android apps. Neds’ betting navigation is easy to use, it’s odds and markets are fiercely competitive and the people behind the business are some of the best in the country – we expect the bookmaker to be a household name immediately and we recommend that punters add them to their shortlists when it comes to betting on racing and sport. TopBetta is another bookmaker that has not taken long to gain significant traction on the Australian market due to its innovation and willingness to offer something different to punters. After establishing itself in 2010, TopBetta had its license in Norfolk Island stripped in 2016 and re-established itself in the Northern Territory alongside industry heavyweights like Sportsbet and Crownbet. A re-launch in 2016 paid immediate dividends. TopBetta’s betting tournaments have been the key to its success – offering punters the opportunity to compete against one another with set amounts, leaders, betting pools and more. The company’s Global Tote product also launched in 2016 to great success, providing punters with superior odds in a competitive market.